3/29/2009Share this story on Facebook! See more photos and video and learn how you can get involved on the Power Shift website. Major in environmental studies at Ithaca College. As an environmental studies major, I was proud to be part of a group gathering to tell Congress and the Obama administration that we believe that dealing with climate change is not only the key to overcoming the economic crisis but is imperative to the survival of our planet. The conference was everything I hoped it would be and more. Twenty IC students drove down to Washington, but none of us anticipated the enormous crowd that greeted us on our arrival at the Washington Convention Center. Approximately 12,000 young people had arrived to lobby Congress. Our hearts raced as we realized we were part of an historic event much bigger than we could have ever imagined. That first night we listened to speakers discuss climate issues and energize us for the weekend ahead. Among them were Van Jones, founding president of Green for All, as well as Majora Carter, an activist from the South Bronx, and other environmental leaders. Nearly every sentence spoken was punctuated with applause, and each speaker received a standing ovation. Clearly, we were ready to make environmental change happen! One speaker was especially memorable: an extraordinarily brave six-year-old girl who walked on stage with her mother to address a crowd of thousands. “I wanted to thank you all for trying to make the world a better place for me and my friends,” she told us. As a college student, I think of myself and friends as the future, but seeing this little girl speak opened my eyes to the fact that we are also fighting for future generations as well as own. On Saturday, we attended workshops and panels. Topics ranged from climate change to fair trade to promoting environmental awareness on campuses. I was especially excited to hear one of my role models, environmental activist and writer Bill McKibben. Ralph Nader even showed up to speak! In our free time we visited environmental campaign tables that were spread throughout the conference. Organizations were looking to spread the word and recruit “leaders” (which our nametags proclaimed us to be). Of course the conference wasn’t all business. At the end of the day, we enjoyed some amazing live entertainment, including Santigold and The Roots! Sunday brought more workshops -- and a five-hour lobby training session to prepare us for Monday when we would no longer be just college students but lobbyists, walking the halls of Congress to attend 350 meetings arranged by Power Shift. I’ll never forget the passion I felt talking to members of Congress about we want -- and need -- to see in climate legislation. 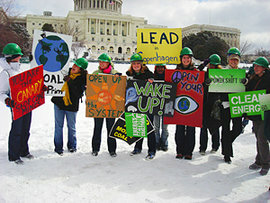 At day’s end, we headed to the front lawn of the Capitol, holding signs advocating for environmental change, and wearing green hard hats. We wanted everyone on Capitol Hill to know that there are thousands of us throughout the country and the world who care about our collective future on this planet. Power Shift 2009 was the largest gathering of climate and clean energy activists in U.S. history; I am so proud to say I was there. It is empowering to know that there are thousands of other college students in the world who understand that climate change needs to be addressed now. The Green Revolution has started, and we’re all a part of it!